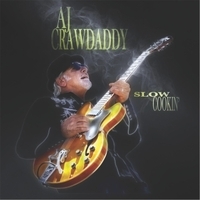 AJ Crawdaddy's "Slow Cookin" is the Band's follow-up to its 2015 debut "Vaporized" (also under Renown Records), and features an exciting blend of West Coast, Chicago, and Delta Blues. Angelo J Rossi, aka “AJ Crawdaddy” is an American Blues Guitarist born in Palo Alto, California and a long-time Bay Area performing artist. AJ is best known for his work with the popular Marin-based pop group Pablo Cruise which charted multi-platinum albums, "A Place In The Sun" and "Worlds Away," and producing hits like, "A Place In The Sun," "Love Will Find A Way," "Whatcha Gonna Do” (When She Says Goodbye), “Rio" and "Cool Love." He is a BMI published writer and a voting member of N.A.R.A.S. (Grammy). AJ owns and operates The Cave Recording Studio in The San Francisco Bay Area, recording and producing local artists such as Bruce Conte, Finis Tasby, Terry Hiatt, Steve Freund, Paula Harris, Terrie Odabi and others. He has also worked with the likes of South Bay Blues recording artist, Christoffer "Kid" Andersen and Harmonica savant Aki Kumar, and immerses himself in the local San Jose Blues scene by frequent participation in several local Music Jams and Blues Society events. On the other side of "the studio glass" as a guitarist, AJ has worked and recorded with Flora Purim, Airto Moreira, Jaco Pastorius and legendary record producers Thomas J. Dowd, Bill Schnee, Bob Monaco and Jim Gaines. His love of music performance is infectious, and his presentation of the Blues genre is authentic, energetic and fun for the listener. Additional artists on "Slow Cookin" are Peter Booras (Drums & Percussion), Greg Jones (Bass Guitar), Jimmy Dewrance (Harmonica & Lead Vocal), Baxter Robertson (Piano & Lead Vocal), Michael Peloquin (Saxophones), and Marcel Marchetti (Trumpets). Special Guests on this record include Nate Ginsberg (Piano & Hammond B3), Endre Tarczy (Piano, Bass & Guitar), Simon Govan Smith (Guitar), Christoffer "Kid" Andersen (Guitar), and Jim Pugh (Hammond B3).